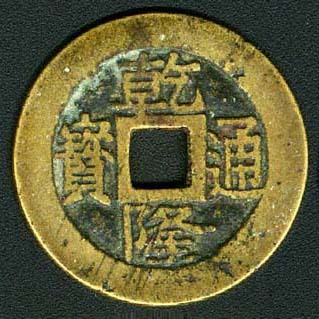 In 1616, Nurhachi had declared himself emperor and cast cash in Chinese style, with both Han and Manchurian inscriptions. His cuccessor, Abahai defeated the Ming quickly, but passed away before the claim of the throne. In 1644 his son Shih Tsu was made the first emperor of the Qing Dynasty (or Ching Dynasty), which was to rule China until 1911. 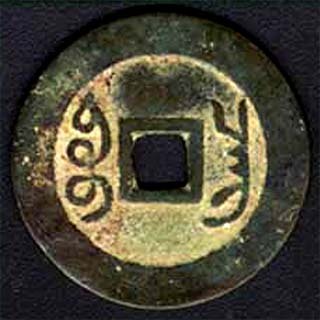 The second one was issued with the uniform inscription in Han script of Shun Chih T'ung Pao on the obverse, and one Han script on the reverse at the side (left or right) of the hole or at the top of the hole. 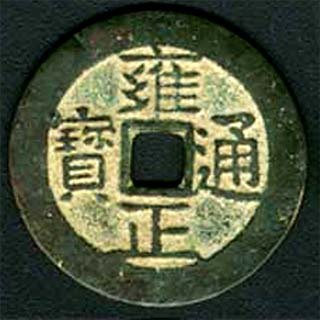 The third one was issued in about 1653 or 1654 with the legend of Yi-li (one cash) in Han script at the left side, and mint mark at the right of the hole. Later in about 1657, he issued another two types of T'ung Pao cash for circulation. They were issued with legend in both Han and Manchu scripts on the both side of the hole, or with legend (either Board of Revenue or Board of Works) in Manchu script only. In 1661, The young Shun Chih Emperor caught smallpox and passed away. His third son, Hsuan Yeh was chosen to succeed the throne at the age of eight with the reign title K'ang Hsi. The Emperor K'ang Hsi had reigned China for 61 years. 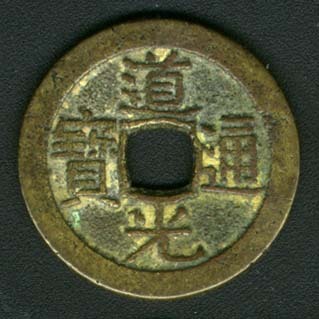 On the obverse of this cash is the legend of "K'ang Hsi T'ung Pao" in direct reading and on the reverse is bearing with "Che" mint marks in both Han script and Manchu script. It was cast by Hangchow Mint of Chekiang Province. It was first established in the 6th year of Shun Chih reign (1649AD). 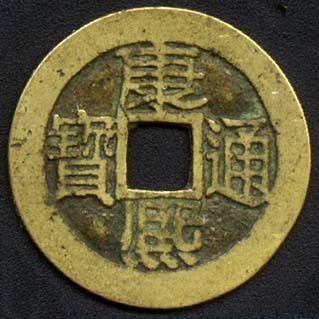 After it terminated casting coins in 1662, Hangchow Mint reopened to cast coins again in 1667. It ceased minting in 1674. 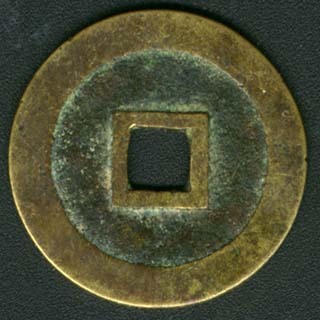 In the 35th year of K'ang Hsi reign (1696AD) another mint was established in Chekiang Province casting coins until 1698. It is very strange to me that some of the numismatic works pointed out, Chekiang coins are too small with a reddish appearance, similar to those of Hunan and Kwangtung. But I don't think so, at least what I have seen are the same as other standard cash of Qing dynasty. 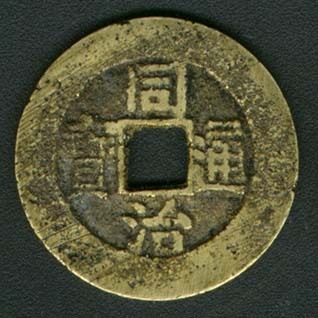 This cash was cast by the Nanchang Mint of Kiangsi Province, it was cast with the legend of "Yung Ching T'ung Pao or Yong Zheng Tong Bao" in direct reading on the obverse and with Manchu characters "Pao" and "Ch'ang" on the reverse. I personally think that this is a rare coin in Hong Kong, though most of the articles or references of Chinese coinage suggest this coin as a common coin. 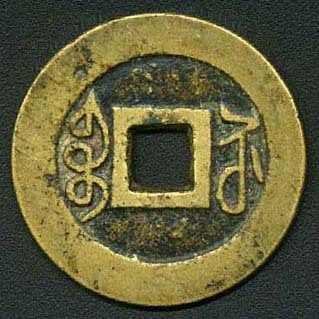 Ch'ien Lung T'ung Pao is the most common standard cash in the history of the Chinese coinage. I don't know whether you agree or not. Ch'ien Lung Emperor (Emperor Kao Tsung) had ruled China for 60 years. Plenty of the copper cash were cast during the period of the Ch'ien Lung reign. 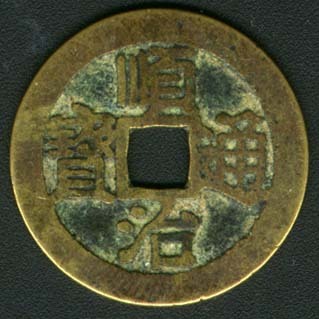 On the obverse of this cash is the legend of "Ch'ien Lung T'ung Pao" in direct reading or symmetric reading. 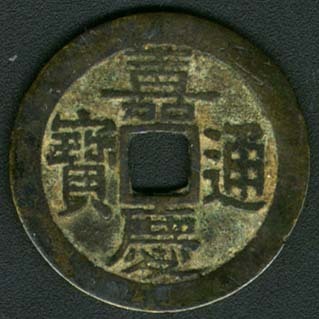 On the reverse of this coin, bearing the identification mark in Manchu scripts "Pao" and "So" showing that this coin was cast in Soochow of Kiangsu Province. 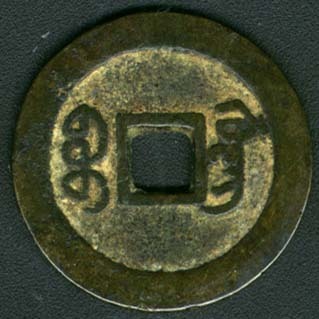 This Chia Ch'ing T'ung Pao cash was first cast in Canton Mint of Kwangtung Province in 1796. There is no record of cast cash in Kwangtung during the reign of Yung Cheng. The Canton Mint was re-opened in 1745 and commenced minting the Ch'ien Lung T'ung Pao cash. 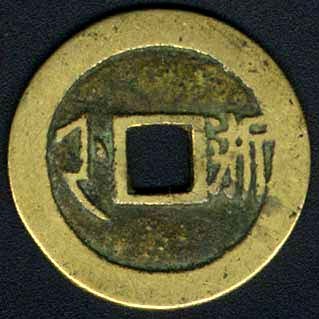 On the obverse is four Chinese characters Chia Ch'ing T'ung Pao, with a square hole in the centre. 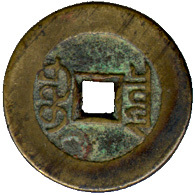 On the reverse are two Manchu scripts meaning Canton Mint on either side of the hole. 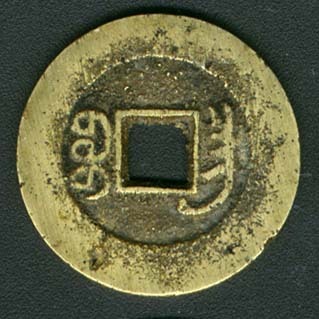 Canton Mint of Kwangtung Province carried on casting the Tao Kuang T'ung Pao cash coins in the same format as the Chia Ch'ing Tung Pao with the Kwangtung Mint mark for successive emperors during the reign of Tao Kuang (or Dao Kuang) (1821-1850). When I mention about the Tao Kuang period, I hardly forget the the Opium War. Although the import of opium to China had been banned by the Qing government in 1796, the British went on and even increased its export to China. Tao Kuang Emperor recognized that the opium would damage the health of Chinese and also drained the country's silver reserve. He decided to take strong action to stop the import of opium from England. Lin Tse-hsu was appointed as Imperial Commissioner to confiscate and destroy the illegal opium in Canton. The First Opium War took place in 1839, unluckily the Chinese were fefeated by the British, and the Qing government was forced to sign the Treaty of Nanking in 1842. According to Article III of the treaties, Hong Kong was ceded to Britain and the Article II stated that 5 ports would be opened to foreign trade. Following the Treaty of Nanking, Chinese courts would be no more to try the British citizens, the social and economic order of China was violently shaken. This Hsien Fung T'ung Pao cast in the same format as the Tao Kuang T'ung Pao, except that the mintage of Hsien Fung one cash is much less than the previous regents. It was because the Qing emperors became very weak and failed to provide the necessary leadership from the middle of 18th century. Some Chinese formed sccret societies and frequently started rebellions in order to overthrow the Qing government. So that the Qing government found itself in extreme need of revenue to suppress the rebellions such as the Taiping rebellion in 1851. The Qing government issued the big cash with great face value, from ten to a thousand to the market in order to meet the military expenses. Another reason for the rareness of Hsien Fung Pao Kwang cash is that when the 2nd Opium War (1857) broke out and Canton was occupied by the France and Britain forces, resulting in the closure of the mint. No cash was cast again in Canton Mint until 1889. When Hsien Fung Emperor passed away, Tung Chih was only 6 years old. His mother Empress Dowager ruled China behind curtain until he was 17 years old. Tung Chih Emperor was very unlucky that he died at a young age of 19. 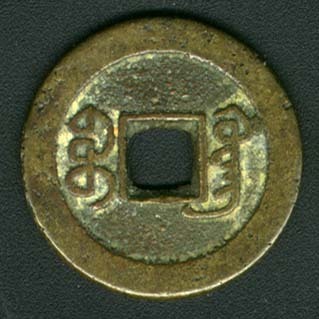 This Tung Chih T'ung Pao was cast by the Nanchang Mint of Kiangsi Province during the T'ung Chih period (1862-1874). The colour of this cash declares the poor content of this coin. It denotes that the content of copper in this cash is much reduced. 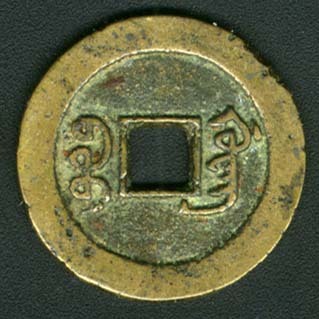 Some of the numismatists point out that during the Tung Chih reign the one cash coins were cast in ever decreasing diameter and the smaller ones are known as 'Depreciated Cash'. 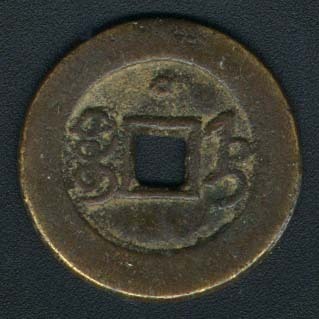 This coin was cast by the Chih Li Mint of Tientsin in Hopei Province during the Kuang Hsu period (1875 - 1908). It was inscribed as normal with the name of the reign period of issue on the obverse and the mint name on the reverse, except that there is a small circle mark appears above the hole on the reverse. Hsuan T'ung is the last emperor of the Qing Dynasty. The minting of cash coins by the tranditional method had come to a standstill because of the casting method did not work economically. 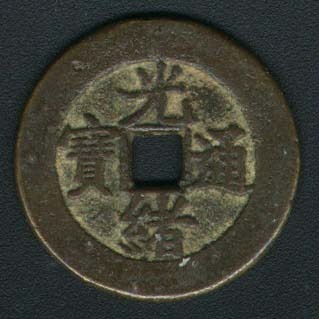 Only very few cash coin were cast during the end of the Hsuan T'ung period (1909 - 1911). 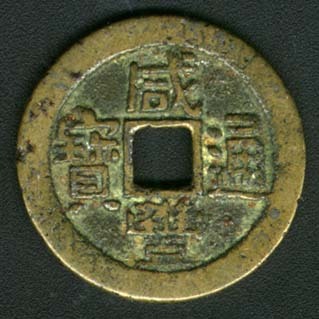 Inscriptions bearing on the obverse of this cash is Chinese characters "Hsuan T'ung T'ung Pao", with the meaning of "Hsuan T'ung Current Coin". 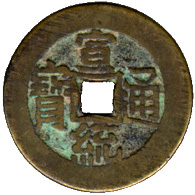 The inscriptions on the reverse of the coin are Manchu characters "Pao" [left] and "Chuan" [right], meaning Hu-pu Pao Chuan Chu [Board of Revenue]. Liu Chu Cheng ¡G ¤¤°ê¥j¿úÃÐ (Illustrative plates of Chinese ancient coins) National Bureau Cultural Heritage 1988.